2007-2008 by Wimwag All rights reserved. Please do not use my original photos or reprint my writing without asking me for permission. Thank you! Fabric, Fabric, Everywhere but not a stitch to spare. We have been a bit busy around here lately participating in a bit of a spring spruce up. We have people over quite regularly and our space is so small (600 square feet) that we are always self editing. The first major thing that needed to be done was I recovered the vintage chair in our living room. It has its original upholstery but it was definitely starting to show its age. I had previously slip-covered this chair for another room years ago and swore off sewing a slipcover for life but found myself forced to cave in since the chair was starting to look real rough. I think it came out some what successfully but I really need to brush up on my sewing skills. I also knocked out some pillows that needed to be re-covered as well. I did two with piping which I View this photo know realizes makes them look so much nicer than the plain ones. I used all fabric I already owned in the stash including this wonderful vintage fabric that I adore. David mentioned how much he liked the pillow fabric as well so we have decided that we are going to use the colors featured on the pillow to decorate a room the next time we move (We are definitely not repainting here!). We also got some new bedsides tables with drawers!!! Hooray for storage. This cleared up so much space on the sides of the bed as well as in our closet oddly enough. Plus there is way less surface area for dog hair to collect on our new ones. They also roll out of the way when cleaning!! (Do you notice an emphasis on cleaning dog hair here? Ugh the shedding.) Other than that things are going okay as David starts to transition to a civilian life. So its been forever since I have posted anything. Sorry about that. 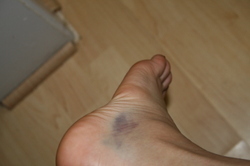 Due to a lingering (and I do mean lingering) ankle injury things have not been all that fun around here lately. We have mostly been in the house when not at work due to the fact that we both have foot/ankle injuries and its too cold for our southern selves outside. Today was the first day we need anything really of merit. We went to the Adventure Travel Expo (thanks to our awesome travel agent Mindy we were able to attend for free)! We got some cool travel information, especially regarding our new favorite destination, Mexico!! After we had our fill of travel info we decided to go to a restaurant I have been dying to try since we have lived here. This restaurant is so synonymous with D.C. it was on my list of places to eat before I left. Two Amy's is probably the best known pizzeria in the famed Gourmet Pizza wars of D.C. David and I arrived starving. We started with a local microbreweries beer and appetizers. I had a wonderful Potato frittata served cold with a red pepper pesto. The pesto was sweet and the frittata was filled with perfectly cooked potatoes. David had these amazing deviled eggs that had the fluffiest yokes I had ever seen. The green pesto that came with his eggs was wonderfully salty (thanks to anchovies I think). These appetizers were so stellar (next time I swear I will take pictures). Of course the pizza was great as was to be expected but I think the appetizers are what made this meal so spectacular. Anyway thats really it for now. David is kicking me off the computer so he can work on job applications so for now Au Revoir. So I sort of started a "Lost" viewing party each Thursday at my apartment. This has worked out great because it is a nice calm mid-week get together which is very nice. Anyway the other day my friend Lisa came over and she brought this great bottle of wine. Now I love Red Wine but I am by no means a wine expert but this wine a Pinot Noir from Castle Rock was great. It has this wonderfully rich yet light flavor almost like grape juice. I found it at Whole Foods the other day and it is about $15 a bottle but well worth it in my opinion. I highly recommend it. Sorry about the horrible delay in blog updates but I have now sprained my foot twice in a 4 week period and it is starting to take its toll! I thought I would share a few things I have created lately. First of all I finished David's Valentines day gift and gave it to him early today. I decided to give in and give it to him since it is very hard to hide something in our tiny apartment without him accidentally finding it or it getting damaged because he doesn't know it's there. I have already made a couple of these shadowbox/multi-layered picture things for my Mom and Dad but this is David's first one. ( I could tell he got a little jealous this holiday season when other people got them.) I have the method down pretty well at this point since its my 4th one but they are still time consuming. Anyway David loves the TV show Aqua Teen Hunger Force. It's humor eludes me a bit but I get his attraction to it so I decided to make him one based on the shows main characters. I used some stills I found online as well as some scanning and put it together today. Everything is hand drawn and colored by me. I don't know if you can tell in the photo but the characters are floating above the background at different levels to show their locations in the scene. (You can click on the pictures to make them bigger). If you don't watch the show the characters are going to look really strange but I swear they are real and I didn't make them up. He really seemed to like it but now I have to find a place in the house to hang it!!! Other things I have been up to the last couple of days including icing my foot, cooking a little bit, icing my foot, and did I mention icing my foot? I did make this awesome custard/pudding concoction that I learned about from one of my favorite sites. This recipe was so simple and so delicious. It was the perfect rich dessert for this very cold time of year. Plus I finally got to use the vanilla beans that I bought forever ago. If you can't find vanilla beans you can use extract but I have to say the beans are totally worth it. You can see in the included picture as I am cooking it the bean tail poking out!!! They have such a wonderfully mellow flavor plus its awesome to have the little black bits in the pudding. Yum Yum Yum. Has anyone else noticed that Valentines day is on a Thursday which totally is LOST day. Whatever shall I do? I think we are going to celebrate on like Friday or something. Oh and I showed you what I made David but he also got me an awesome gift. He is paying for HOLGA photography classes for me!!! Yeah. Hopefully I will eventually get to post some awesome Holga shots. Well thats all for now but I swear I am going to try and update at least once a week. More Lost Info. Flights and what they mean. As you should know On the Oceanic Press Release located here http://www.flyoceanicair.com/. It lists the cities that Oceanic will be flying to. If you go here http://www.flickr.com/search/?q=lost+billboards you can see photos people have taken of actual real life billboards in the cities. Its very interesting that a show is able to spend the $ put up fake billboards. It has yet to be seen how much of a clue they are. I was also thinking of the cities that there will be flights to. Los Angeles, CA - This is where Shannon and Jack are from ( as well as Nikki). Also where Shannon's dad dies. Tustin, CA - Locke is from here. Hurley's Box company is here (where Locke worked of course). Ames, IA -Kate is from Iowa. I am not sure the town. Portland, OR - This is where Ben Linus (Henry Gale) was born and also I believe where Juliet went to work for the company. Knoxville, TN - This is where Anthony Cooper the real "Sawyer" lived when Sawyer (James Ford) wrote him the letter. Seoul, SOUTH KOREA - This is where Sun is from. Syndey, Australia - This is where Claire is from. This is the first of probably many more Lost posts to come. If you have somehow missed it Lost has released some new info. The first part was the Oceanic Press release followed by the commercial both available here http://www.flyoceanicair.com/ . The Lost team is genius since they actually played the commercial on t.v. like a true airline would. I would not even know about this except my sister actually saw one playing during a Twilight Zone Marathon! It's really quite effective because so many people I know who are a bit ho-hum about Lost have gotten really excited with the onslaught of new info. There is also this website http://www.find815.com/site/index.php#Scene_1 featuring much more of Sam and his story. Find815.com keeps having new information added. If you play little games or find clues and it reveals more information. If you look in the bottom right hand once you have gotten through some of the current stuff it will tell you how long until the Lost creators add new content. They will be adding more content until just 2 hours before the premier on the 31st of January!!! This is interesting because after the first ARG they denied there would be any more. I wonder if this is due to the fact that we may get an abbreviated season due to the writers strike? Lostpedia explains a little more about the games here http://www.lostpedia.com/wiki/Find_815 but it's more fun if you play it yourself on find815.com. My major resolution this year is going to be to try and only use reusable bags. I have the cloth Whole Foods bags like everyone else and I have a few other cotton totes but I don't always use them. I bought a small cotton bag the other day that fits in my purse and I have used it at least 5 times in the very short amount of time I have had it. Its so much easier when you are checking out and when you reach for your wallet you see the bag. I really encourage everyone to try and cut down on their plastic bag use. I think I am going to get these at some point. They are just so small and it looks like it would be easy to keep a couple on you most of the time. Also many stores are starting to offer refunds if you use your own bags and some stores like Ikea are starting to charge per bag you use so this seems like a good time to get with the program so to speak. This is the first post at my new site. I am not sure if I will move all the old ones over or not.